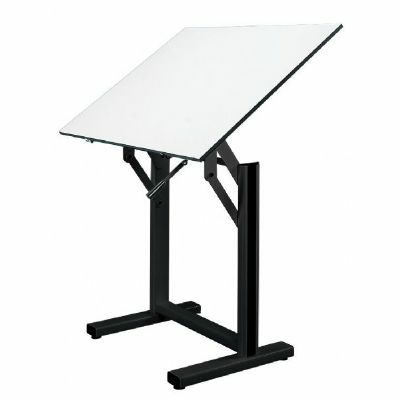 Home > Drawing Supplies | Drawing Tables & Art Tables | Alvin® Ensign Table, Black Base White Top 31" x 42"
Looking for a super-strong desk/drafting-table with a lot of surface area for your projects? The Alvin Ensign table with a 31”x42” top is perfect for you! The Melamine surface is easy to clean and the base is adjustable to meet your needs. Function is found in every aspect of the Alvin Ensign BLACK Base W/31X42 Top drafting table. This provides you with a 31”x42” white top that sits on a black base. The top is Melamine, which is both study and warp-free. It’s easy to keep clean and it gives you the space needed for working on documents, drawings or anything else. You can make adjustments to the top from the base including a 0 to 90 degree angle and a height of 35” to 47”. It is balanced with traction springs to ensure your surface is right where you need it to be. The entire desk is sold as one unit. Very happy with this sturdy table! You can quickly and conveniently adjust the height and angle with the simple release of a brake lever. The 47 inch max height is especially useful since I draw standing most of the time. You can fold it down when not in use and doesn't take up much space. The price here for this model is the cheapest I've seen anywhere and the shipping was fast and hassle free. Great table!